Everyone you know is on Facebook. Or Twitter. Or something. Everyone but… gasp—the CEO of the company you work for? It’s true—61 percent of CEOs have no social media presence whatsoever. In a digital business world where customer service is measured by the immediacy of a Twitter response, it’s shocking to think that less than half of Fortune 500 CEOs are active on a major social network. Hootsuite’s CEO, Ryan Holmes, has discussed the benefits of having your company’s C-suite on social media. It makes sense that as the workplace becomes more reliant on digital technology, the heads of companies would want to be there. Here are a few real-life examples of executives doing awesome things on social media to further drive the point home. As the head of Tesla Motors, SpaceX, and SolarCity, and co-founder of PayPal—one of Elon Musk’s proudest moments happened when he publicly responded to a customer complaint and actually did something about it. A customer Tweeted directly at Musk’s Twitter handle—expressing his concern about already-charged Tesla vehicles taking up space at designated charging stations called Superchargers. Musk followed up first by responding directly on Twitter. Then only six days later, announced a new company policy on Tesla’s website that fully-charged cars left at Supercharger stations would incur a $0.40 per minute idle fee. The lesson here is for executives to show customers how much they’re valued. Musk doesn’t just take customer feedback and toss it into an insights report—he listens, personally responds, and then makes it happen fast. In any kind of company, this is what we’d call delivering excellent customer service. Steve Wozniak, co-founder of Apple, is one of many executives who have taken to Reddit to answer questions from the community. He uses his Twitter to provide “proof” that it’s indeed him tuning in, as per Reddit guidelines. Looking forward to @reddit AMA about tech, entertainment, people, life. March 16, 1pm PDT. Reddit AMAs, or “ask me anything” sessions, are an awesome opportunity for thought leaders and industry figures to open up their companies and connect with the public. With his Reddit AMA, Wozniak demonstrated his affability, respect for the past, commitment to the future, and his passion for the tech industry. What jumps out at us, in particular, is when asked about his support for Steve Jobs’s successor, Tim Cook, Wozniak responded graciously. 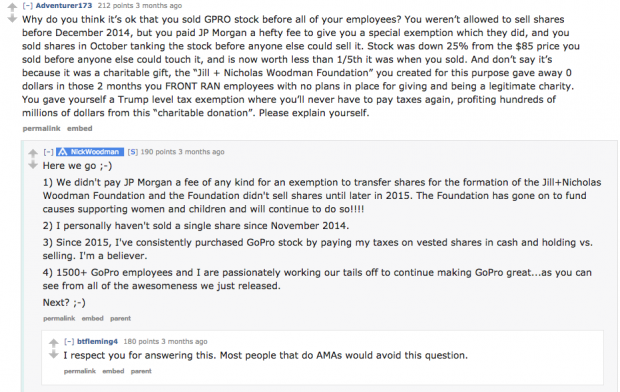 A similar situation occurred in a Reddit AMA for Nick Woodman, the CEO of GoPro. When confronted with a particularly controversial question concerning stocks going to big banks before GoPro’s employees, Woodman didn’t shy away from answering. He’s even been commended for his straightforwardness. Redditors don’t take it kindly when their questions are dodged, or worse, when the discussion is used a PR stunt. You don’t want to become an AMA Disaster. Wozniak is extremely transparent and genuine with his responses. On top of that, both he and Woodman make it a priority to address sticky questions head-on and with integrity. Speaking of Reddit, the co-founder of the online community, Alexis Ohanian, has his own social media brand. A few weeks ago, I got a @Reddit PM from a reader of #WithoutTheirPermission that absolutely made my week when it happened and he allowed me to share it. Getting on the bestseller list is great, but getting an email like this is everything for an author. You write a book because you hope it takes someone away from their life for a few hours to really open up a new way of thinking. In this case, helping them help themselves change their life in a material way for the better. Ben, your choices are going to pay dividends for you the rest of your life and I'm hoping to hear from you over the years as you keep leveling up. You did that! Thank you so much for this note. And thank you for your service. On Instagram, Ohanian posts photos from his personal and public life—showcasing his family, work, political views, and more. #TBT to the two who made it all possible – my mom and dad – photographed in their tiny studio in the Village circa 78 or 79. #oldschoolcool They didn't have any money, but they had each other. Dad couldn't afford an engagement ring, so he bought her a pair of silver earrings for when he proposed to her in Washington Square Park after dinner one night. By the time I showed up, they were living in Ft. Greene, Brooklyn and figuring out how our little family was going to make it all work. What they didn't have in things, they had in hard work… and love, which created the environment that produced me. They supported me, even the crazy ideas I had, like starting a company – on the internet! That foundation has long been my unfair advantage. I'm going to spend my life working to earn it. _____________________ Thanks to my cousin, Chloe, for finding this. Ohanian also Tweets multiple times a day, sharing thought leadership pieces, articles that interest him, and of course, links to Reddit threads. While Ohanian posts content derived from Reddit, it’s framed as a conversation-starter or an invitation for his followers to contribute to the discussion. Executives can use social media to promote themselves and their organizations. What we love about Ohanian’s social media presence is that it promotes his company while engaging readers in a relevant way and telling us a little bit about him as a person. It’s a pretty solid trifecta. Cory Nieves—or more famously known as Mr. Cory—founded his own cookie company, Mr. Cory’s Cookies, at the ripe old age of nine. He remains the CEO of that company and contributes to Target’s Art Class—a kid’s clothing line. Unlike most of the CEOs that we’ve seen, he Instagrams everything. Nieves focuses on Instagram because that’s the best channel for his product and target audience. By not spreading himself too thin, he’s able to maintain and grow an impressive following. As a prominent female exec, Sheryl Sandberg, Facebook COO, champions gender equality in the workplace, particularly in the tech industry. Sandberg discusses how social media is changing the workplace, politics, and the world we live in. She also works hard to help women get into positions of power. Executives should use social media to showcase their passion for causes and their respective industries. You might not have the same kind of clout that Sandberg does, but people take notice when you use your platform for good. You can use social to champion causes that you believe in and share your humanity with your followers. Now that you’ve got some executive tips on your hands, put your newfound knowledge to use on your social media platforms. Try Hootsuite for free today.